It's always so exciting when the invitations arrive. The date and venue have been set, guest list complete, themes and ideas discussed, to do lists galore! I'm thrilled to be working on an intimate and bright dinner party taking place in May at the fantastic Brooklyn Grange Rooftop in New York. Here is a shot of the invitations which have just been posted. Very exciting! (Please note I've had to crop the title and date for privacy reasons). Rooftop farm, one long table and the big city lights, I can't wait! 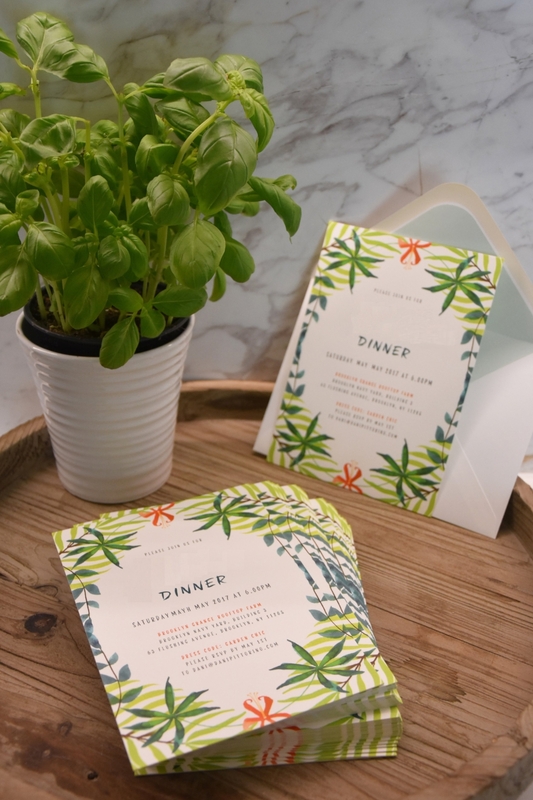 There is no need to spend a fortune on simple, flat-printed invitations that are beautifully designed and still excellent quality. Papier are my go-to stationer; it couldn't be easier, they have a huge range of designs that you can personalise, you can order a sample of your design, choose between standard thickness (324gsm) or double thickness (650gsm, which is so worth it), and receive the entire set in a couple of days. The best part is that you can manage it entirely yourself on their website, and trust that Papier will perfectly print and deliver your stationery. Check out more designs from the gorgeous Emily Robertson collection on Papier here.